Let me come right out and say that I don’t like to promote the consumption of too much beef for several reasons. In our house we eat beef about three times per month, and when I make it I plan for about 3-4 ounces per person. Furthermore, I only purchase GRASS-FED beef. Call me old-fashioned, but I am a firm believer that if you are going to eat animal protein, then it should be an animal that was raised in a natural environment with a diet that is also native to that species. With respect to cows, that means cows that graze in pastures eating GRASS. There is plenty of research supporting the notion that grass-fed beef – compared to its confined feedlot counterpart – is lower in fat and contains cancer preventive, fat-burning properties. Grass-fed beef also contains higher amounts of Omega-3 fats and is generally raised without the use of antibiotics and hormones. It is almost like making a choice between eating a fit and happy animal which has eaten a health food diet, and eating a stressed out, overweight animal which was fed fast food its whole life. If you need more convincing, please read Michael Pollan’s fantastic book, The Omnivore’s Dilemma. Beef is a very warming food, more appropriate for the colder months, and it becomes even more warming when cooked with onions. Brisket is a very tough cut that needs long, slow braising to help tenderize it. If you like your brisket so soft that you don’t need a knife to cut it, this recipe will not disappoint. The meat shreds easily and melts in your mouth. Best of all, the house will be filled with a wonderful, warm aroma. But do plan ahead since cooking this the day before helps to develop the mélange of flavors. Really, the only way you can screw this up is by letting it dry out. Lastly, be aware that brisket shrinks tremendously once it has cooked. A 6-pound brisket fed a class of 12 women with enough for two of my kiddies to enjoy it as an after-school snack. In a dutch oven or other heavy baking pan large enough to hold brisket, heat 1 tablespoon oil in oven 10 minutes. Pat brisket dry and season well with salt (I used about 4 teaspoons) and pepper on the top and bottom. Roast brisket in pan, uncovered, 30 minutes. While brisket is roasting, in a large heavy skillet cook onions in remaining 2 tablespoons oil over moderately high heat, stirring, until softened and beginning to turn golden. Reduce heat to moderate and cook onions, stirring occasionally and reducing heat if necessary, until deep golden, about 20 minutes more. Stir in garlic, paprika, salt, and pepper and cook 1 minute. Stir in water and wine and bring to a boil. 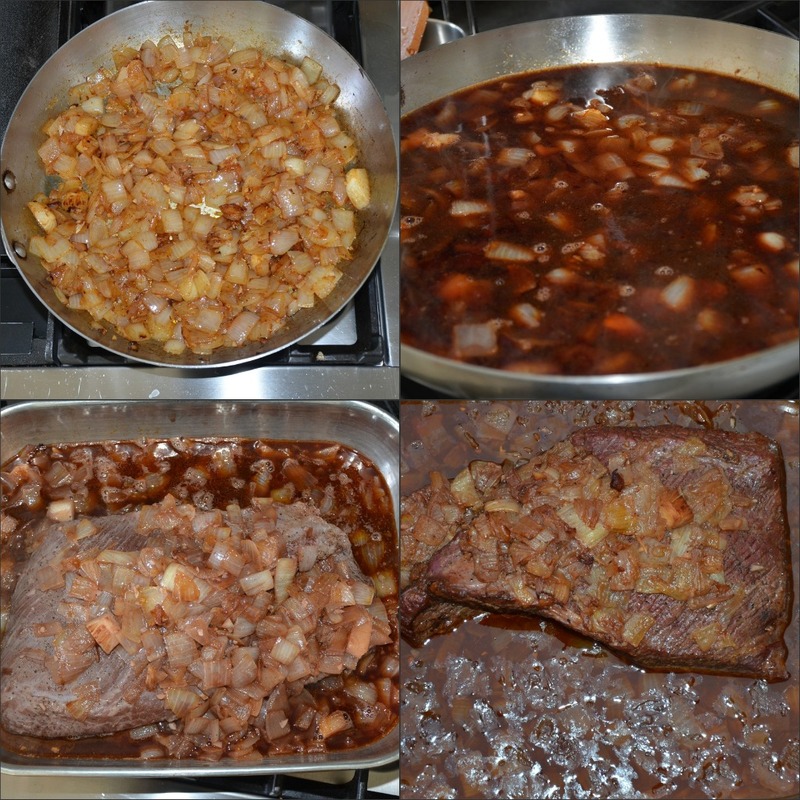 Spoon onion mixture and chopped tomatoes over brisket and bake, tightly covered, 3 ½ hours, or until brisket is tender. (Check pan every hour and if necessary, add more water.) Remove brisket from oven and let cool in onion mixture 1 hour. Preheat oven to 350 degrees. Discard fat from onion mixture and transfer to a blender. Add enough water to the blender to measure 3 cups total. Blend until smooth. Slice the brisket against the grain as thick or thin as you prefer. In a large ovenproof skillet heat gravy until hot, add brisket and heat in oven 30 minutes. Or you can continue to heat on the stove, covered until heated through. Hi Pamela! I’m so excited to be making this recipe for Passover tomorrow night. Do you know if I’d use the same oven temperature for convection? I can turn my convection on or off and wondered if it would turn out better in convection? Thank you for your help. I don’t think it will turn out better using convection. But if you do convection, lower the temperature by 25 degrees. If I were going to make a 9 lb brisket would I double the sauce ingredients? Thanks! Hi Pamela, can this recipe be frozen ahead of time? If so, in the sauce? And how far in advance? Thank you! 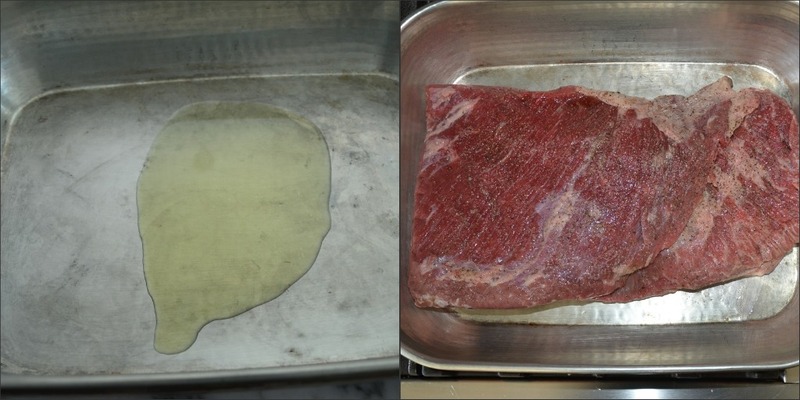 I didn’t understand the directions with the fat the next day – remove the fat and blend it with water? Is this the gravy?plrase explain. Just started following you. Love your recipes!! The next day, scrape the fat off the top – it will be somewhat firm. Throw the fat out. Blend what is left, i.e. all the onions and pan juices minus the fat. This will be the gravy once it is blended. Let me know if that doesn’t make sense! It’s wonderful and such a help to have it made the day before. Happy holidays! Amazing brisket I would say after hour 2 in the oven to check it more often. After adding two more cups of broth I left to do house chores for an hour and came back to the sauce being burnt! 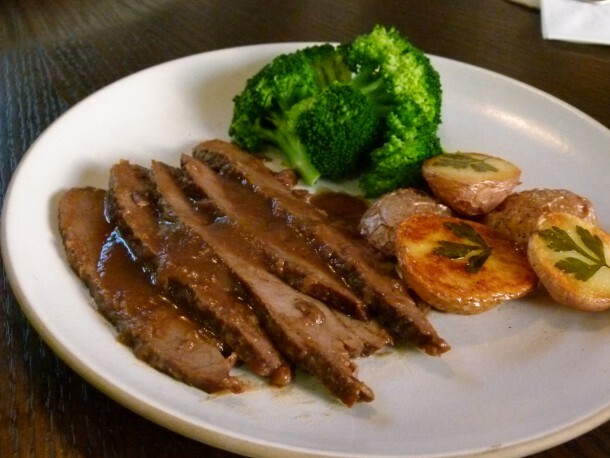 I made a new sauce quickly but would have much rather had this braised sauce! Will make it again monitoring it more. Hmmmm, sounds like your oven runs hot! Unless you used the convection setting rather than the standard…? Let me know. Otherwise, next time start with more liquid and as you said, monitor the pan more often. Do you wrap brisket in tinfoil and leave it in the refrigerator over night? Then once sliced and you made the sauce put back in oven for 30 minutes? Thank you! I feel silly. I misread the recipe. Roast the brisket in the oven for 30 min., not sear on the stovetop. Thanks! Hi, this looks amazing, but I’m wondering if you really meant to sear it for 30. min or 3 min. in the pan before baking? Thank you so much! Looks so yummy. Since we are kosher what would you sub for the ghee? There’s no ghee in this recipe! 🙂 Just olive oil. Hello! If I wanted half the recipe, would the cooking time be exactly half as well? Thanks! Excellent question, but no. You still need to cook it for 3 hours. You would use a smaller roasting pan though. Where do you buy your grass fed beef? At Whole Foods and my local farmers market. This looks so great!! Very similar to how my mom makes it.. If i make it in the am, refrigerate.. then reheat as per your instructions an hour before dinner, do you think that will turn out as good as making it the day before? I think it will be delicious. Go for it. Never even made brisket before… is this possible in the slow cooker? how would i go about making it…speaking to the novice cook 🙂 thanks… could make for company. I think it would be perfect in the slow cooker! But I would still sear the brisket in a hot pan, transfer it to the slow cooker. Cook the onions in a pan and cut the liquids in half and pour all that on top of the brisket. Cook on LOW 9-10 hours or HIGH 5-7 hours. I personally think in tastes better if you make it the day before and it slices more easily cold. Let me know if you have any other questions. 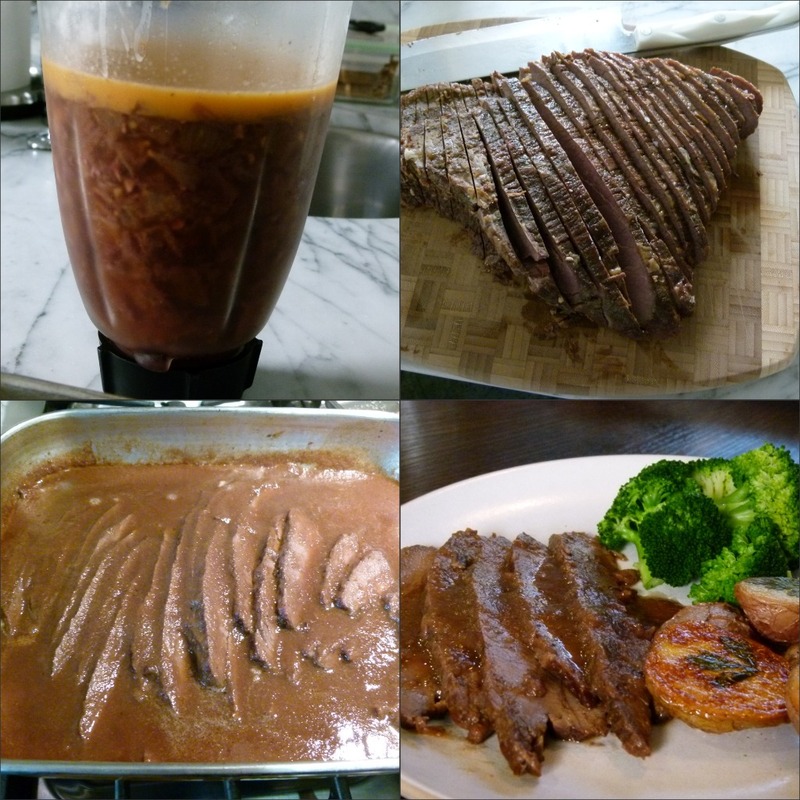 I am going to use your recipe to make a brisket for Rosh Hashana on Wednesday night. However, my family prefers the brisket a little on the sweet side. Would you recommend maple syrup or brown sugar? If so, where would you add it to the recipe? Thanks. I am sure brown sugar or maple syrup would work fine. I would add it with the water and wine. I bet you could add an apricot jam, just as well. But it is important that you don’t allow that liquid to evaporate otherwise the sugars will burn. If you can do it, make this the day before. I think it tastes better and it gives you a little break the day of your holiday dinner! I’m glad you asked! Cut baby potatoes in half and coat with a combo of melted ghee and olive oil. I probably used two tablespoons of each. Dump all of it onto a baking sheet. Take a flat-leaf parsley leaf and press it onto the cut side of the potato and carefully arrange the potato cut side down onto the baking sheet. After you’ve done all of them, sprinkle generously with salt and pepper. Bake at 400 for about 40 minutes. We are definitely NOT red meat eaters in our house but this dish is right up there with our favorites now! It’s actually a great company dish since most of the preparation is the day before. It is really very moist and flavorful. We loved it the day after!